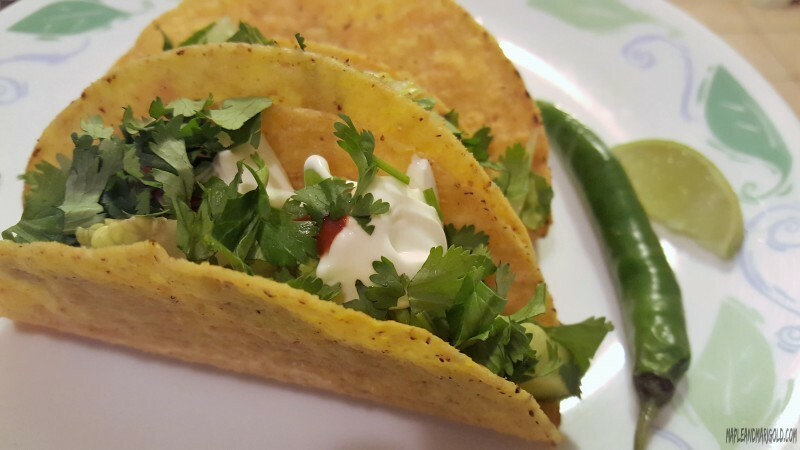 You are here: Home / Dinner in 22 / Mexican Chicken Taco Recipe – Arriba! 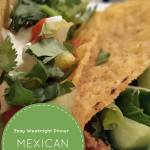 Mexican Chicken Taco Recipe – Arriba! When I think of Mexico my mind immediately goes to quaint streets decorated with flowers, men with sombreros, and women wearing flouncy skirts. I have never travelled south of the United States though and the closest I got to this colourful country was San Diego on the southern end of California. After our first trip to San Diego, we returned with a souvenir or (two) of Mexican silver and also a taste for Mexican cuisine. I admit my knowledge of Mexico is limited but I’ve learnt that much like Indian cuisine, Mexican dishes also use similar herbs and spices. Cumin, Cilantro, red chillies and green, maybe that’s why my family immediately fell in love with the variety – burritos and enchiladas, carnitas and even ceviche. Our favourite by far is the taco. 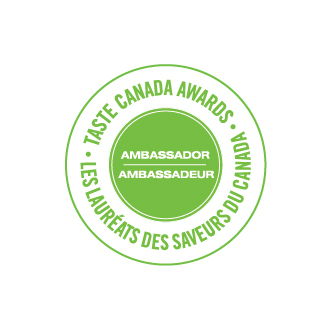 When we got back to Canada, I was not able to find the same fresh and citrus flavoured tacos anywhere (we lived in Calgary at that time) and so after much testing I came up with a way to replicate it on our dining table. 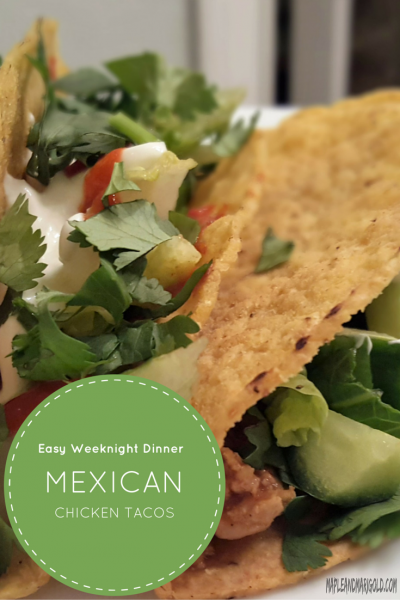 I’m glad to say this chicken taco recipe ended up as one of our favourite weeknight dinners. The kids love the DIY element where they can assemble their own tacos and my hubby and I enjoy the memories of our travels when we almost made it to Mexico. Traditionally tacos are served on soft corn tortillas, I go with the preference around the dining table. My older one prefers corn and because she does, my younger one will ask for the wheat! A number of Taquerías we visited in California used orange juice in their chicken. I have switched it for orange marmalade because it is dry and adds a concentrated orange flavour that I love. Original tacos as I understand would never be served with lettuce, cucumber, or grated cheese. Occasionally there may be sour cream available but it’s not common. I include these in my taco toppings because a) my children will eat them, and b) any meal where kids choose lettuce and cucumber on their own is a win in my book! I use red onions because that is usually what I have on hand for Indian cooking, and it also adds a sweetness that’s absent in the white. Grilled peppers or onions are also a great accompaniment. Salsa – usually a mix of tomatoes and onions with some lime juice. My family is divided over this condiment. My hubby and I are not a fan of raw tomatoes so we tend to stay away from salsa. My younger one loves them but will not tolerate onions which my older one loves. You see the confusion!!! So in our home we eat our tacos like our salsa, deconstructed. 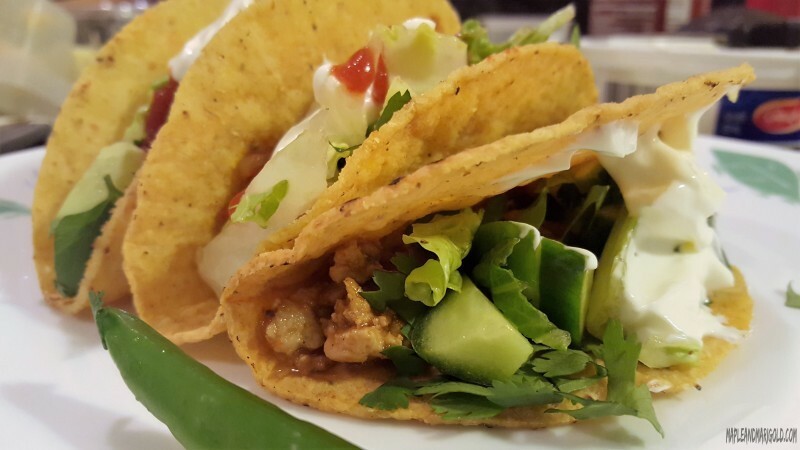 This chicken taco recipe has become a regular feature on my weekly menu. It’s easy, ready in 1/2 hour after school and work even as kids are standing in the kitchen along with you. Older kids can help with pulling the toppings together – washing and chopping the lettuce, cucumbers, grating cheese. And the bonus – these authentic citrus and spring-like flavours make the world a little smaller and bring the exotic a lot closer home. In a pan heat the oil on medium, add in the ginger, garlic, chilli and fry for a min till the aroma changes. Add onions and let them sweat it out. Add in the tomatoes and cook for at least 6-8 mins to cook out the water in the tomatoes. Add in the chicken strips and toss them for a few minutes to turn a little brown. At this time mix the marmalade with a few drops of water to make it paste-y and easier to mix in. Add in the sugar and the cumin. Cook on medium with no lid for 10 mins. You want the meat to become a little crisp. Line them on a baking tray and in the oven 6-7 mins at 375 deg. I admit store-bought hard taco shells don’t taste like the soft fresh ones in California but the oven sure brings out the flavour. Heat oil in a pan and add in the chilli flakes. Let them sputter. Add the corn. If you’re using fresh corn off the cob then this step is only a couple of minutes. If you’re using the frozen variety then make sure the corn is cooked all the way through. It's time to assemble the tacos. Serve with corn slaw on the side. Love chicken tacos and like that with tacos you can customize your toppings to your liking. I add guacamole as well because I love guac and salsa is a must! Its funny how you say because your elder one likes corn, your younger one likes wheat tacos. I prefer wheat for my tacos. The addition of marmalade is unique to me! I should try this since my whole family also loves Mexican food, and , in particular, tacos! Marmalade has become my secret ingredient, Roshni. I use it in my marinades too. Yummy!